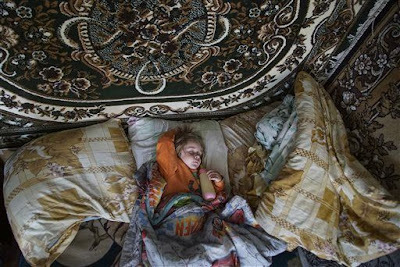 ZALYSHANY, Ukraine — Viktoria Vetrova knows the risk her four children take in drinking milk from the family's two cows and eating dried mushrooms and berries from the forest. Natalya Vetrova, 1, sleeps holding a bottle with fresh cow milk at home in Zalyshany, 32 miles southwest of Chernobyl. But the cash-strapped Ukrainian government canceled the local school lunch program for 350,000 children last year — the only source of clean food in this village near Chernobyl. So rural families are resorting to milk and produce from land still contaminated by fallout from the world's worst nuclear accident three decades ago. Vetrova's 8-year-old son Bogdan suffers from an enlarged thyroid, a condition which studies have linked to radioactivity. "We are aware of the dangers, but what can we do?" said Vetrova, standing in her kitchen after pouring a glass of milk. "There is no other way to survive." Vetrova's family and thousands of others are caught between the consequences of two disasters: the residue from Chernobyl and the recent plunge of Ukraine's economy. After the April 26, 1986, explosion and fire, the most heavily affected areas in Ukraine were classified into four zones. Residents from three of them were evacuated or allowed to volunteer for resettlement. But the village of Zalyshany, 53 kilometers (32 miles) southwest of the destroyed reactor, is in the fourth zone — not contaminated enough for resettlement but eligible for subsidies to help with health issues. Ukraine's Institute of Agricultural Radiology says the most recent testing in the zone showed radiation levels in wild-grown food such as nuts, berries and mushrooms were two to five times higher than what is considered safe. However, Ukraine's economy has since been weakened by separatist war in its eastern industrial heartland, endemic corruption and the loss of Crimea, which was annexed by Russia. Last year, the Ukrainian government, which is propped up by billions of dollars in loans from the United States, the European Union and the World Bank, cut off paying for school lunches in Zone 4. There are no official cost figures, but a typical price of about 20 hryvnia (80 U.S. cents) would put the program's funding at about $50 million a year. "Hot meals in the schools were the only clean food, which was tested for radiation, for the children," teacher Natalya Stepanchuk said. "Now the children have gone over to the local food, over which there is absolutely no control." In 2012, the government halted the monitoring of radioactive contamination of food and soil in Zone 4, which was called the "zone of strict radio-ecological control." The state has also cancelled a program for buying Ferocin, known as Prussian Blue, a substance farmers could give their cattle to hasten the elimination of the cesium-137 isotope. Without financial help, farmers in the area are unwilling to buy it on their own. "The government spends huge funds for the treatment of the local population, but cannot put out a little money on prevention," said Valery Kashparov, head of the Ukrainian Institute of Agricultural Radiology. "I am ashamed to look people in the eye." In the view of Vitaly Petruk, head of the agency that administers the "exclusion zones" closest to the Chernobyl plant, the decision on the school lunches came down to how best to use limited funds. "What is better: to give all the money to people who have radiation sickness and save them, or split the money ... and give each of them four hryvnia (15 cents)?" he asked. "The idea was to focus on certain things, rather than dissipate energy and waste money." This calculation means that many in the village of about 350 people go without food. And beyond Zalyshany, there are some 1,300 settlements in the zone where the lunches were cancelled. Even when the lunches were available, children were likely eating contaminated food when out of school. Nine-year-old Olesya Petrova's mother is sick with cancer and can no longer work. Olesya hungrily awaits the coming of warm weather, when she can scour the woodlands for berries and other goodies. In the meantime, she can hope that one of her classmates will slip her a sandwich. But in economically depressed Zalyshany, such largesse is fitful. The lunch cancellations did not affect kindergartens, such as the one that's in the same building as the local school. The kindergarten's cook, Lyubov Shevchuk, sometimes slips the older children a little something. "Children faint and fall. I try to at least give them some hot tea, or take from one child to give to another," she said. With no government agency taking responsibility for feeding the schoolchildren, it's left to warmhearted efforts like Shevchuk's or to charities. An Italian group, Mondo in Cammino, took notice of the Zone 4 lunch cancellations and raised money to supply the 130 pupils in one village, Radynka, with a year's lunches at a cost of 15,000 euros ($17,000). "We know that Ukraine is near default. They decided that these families were no longer children of Chernobyl," said the organization's director, Massimo Bonfatti. The overall effects of radioactive fallout remain intensely debated. A United Nations report concluded that the additional radioactivity over a 20-year period was approximately equivalent to that of a CAT scan, because of higher levels of the long-lived cesium-137. Ausrele Kesminiene, a doctor with the World Health Organization, said there is little evidence associating radioactivity-contaminated food with cancers other than in the thyroid. But a review compiled by the Greenpeace environmentalist group and published in March found scientific studies indicating children in areas contaminated like Zalyshany show much-reduced respiratory capacity. A European Union-funded study tracking 4,000 children for three years in contaminated areas also found cardiovascular insufficiencies in 81 percent of the children. Yuri Bandazhevsky, a pediatrician who has studied the effect of small doses of radiation on the human body, said there are "very serious pathological processes" which can lead to defects of the cardiovascular system and cancer. Bandazhevsky, whose work is widely cited abroad, was imprisoned in his native Belarus for four years. Supporters allege it was due to his work on studying Chernobyl's consequences; he now works in Ukraine. "With regret I have to state that nobody cares about this, and those hungry children are another proof of how authorities treat a population which suffers on these territories," he said. Nadezhda Ivanchenko, whose grandson was monitored in the European Union study, agreed that the government seems callous. She brought the 10-year-old boy for examination at the hospital in the district center of Ivankiv. He shows advanced sinus arrhythmia of the heart. "People get sick a lot, but neither children nor anyone here are needed. We were thrown away and forgotten," she said. Olesya, the 9-year-old who now often has to go without lunch, wants to eventually become a doctor, so she can "treat everybody for radiation." But for right now, her desire is to fill her stomach with treats foraged from the woods. "In the forest, you don't need money," she said. "There's all kinds of food that can feed everyone."